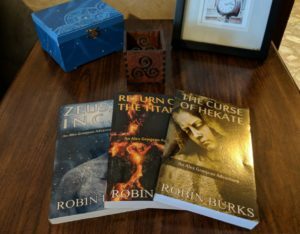 Last night, I received word that my three novels (Zeus, Inc.; The Curse of Hekate; and Return of the Titans) would get inducted into the Coger Hall of Fame for the Darrell Awards. How great is that? I am officially an award-winning author. This is such an honor because it not only means that there are people out there who enjoyed what I wrote, but that those people think I did a good job of representing the MidSouth. This is from the Darrell Awards website. I am beyond thrilled to get this recognition and only hate that I cannot attend the subsequent banquet because of a previous commitment. I am so honored, though, and excited about this newest development in my writing career. It’s also the kick in the pants I need to keep writing and to keep working on the final edits to Madame Vampire.